Mr. and Mrs. William K. Warren Jr.'s multiple Grade 1 winner City of Light, three days after arriving in South Florida, sparkled in his first local work and final breeze ahead a final career start in the $9 million Pegasus World Cup Invitational (G1) Jan. 26 at Gulfstream Park. City of Light has now had seven works since his front-running triumph in the Breeders' Cup Dirt Mile (G1) Nov. 3, which came with Castellano aboard. The previous six had come at McCarthy's home base of Santa Anita Park in Arcadia, Calif.
Never worse than third in 10 career starts with five wins and $1.66 million in purse earnings, City of Light shipped to Gulfstream Jan. 16. 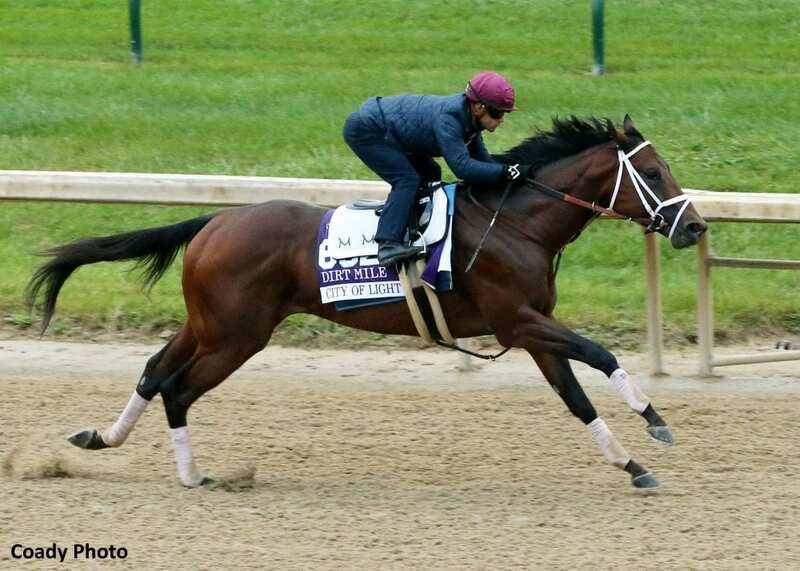 He will retire to stud at Lane's End following the Pegasus. This entry was posted in NL List, Pegasus World Cup and tagged city of light, Gulfstream, gulfstream park, Javier Castellano, mike mccarthy, pegasus world cup, Quality Road by Press Release. Bookmark the permalink.